Peanut butter may have been patented in Canada first, but it is an American staple. Peanut butter has a long shelf life, a storied history, and is full of nutrients great for survival. As an added bonus, it tastes pretty darn good too. You may ask “if it is so good for you, why do they put it in candy?” and I can’t answer that. All I can tell you is that peanut butter is part of my long term food storage plan, and you should consider adding it to yours if you haven’t already. Peanut butter is easy to get a hold of in various sizes and even various types. If you are looking to store in your pantry, you can go grab a jar of JIF at your local supermarket or get a powder mix from a survival food supplier. If you need it on the go, there are bars available and pouches to store in your bug out bag. My first experience with peanut butter pouches was with MREs, and it’s one of the better finds you can get for food on-the-go. Just be sure to keep your stockpile away from your kids. I was taught in school that George Washington Carver invented peanut butter. A quick Google these days disproves this, and shows that the Aztecs may have been the first to use peanut butter as a toothache remedy: The History of Peanut Butter. Carver did write a book in 1916 that sounds like a chore to read: “How to Grow the Peanut and 105 Ways of Preparing it For Human Consumption.” This was not the first introduction to peanut butter by a long shot, since Dr. Ambrose Straub patented a peanut butter making machine in 1903. Peanut butter was sold as a snack food and as a health rehab food since it could be eaten without chewing early on. The crunchy versus smooth debate started early on, with crunchy peanut butter first made by Skippy in 1932. Most of the fat content in peanut butter is monounsaturated fat, which is much better for your heart. Natural and Organic peanut butters usually contain less sugar and sodium, but be sure to check the label anyways if that is a concern. 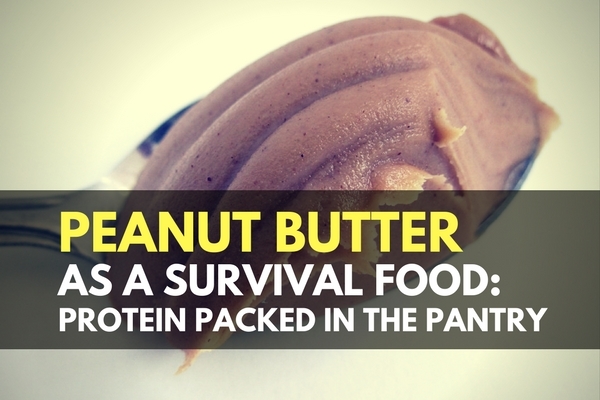 Why Use Peanut Butter as a Survival Food? Filling your pantry with jars of peanut butter might not be the best idea, but having it available in your stockpile is pretty smart. The shelf life of peanut butter bought at the grocery store and stored in a cool, dry environment is easily five years. Most people already buy peanut butter at the grocery store, so this makes an easy food to ‘back stock’ in your pantry. Just buy a few more than usual on your next trip, and rotate your stock as you go through the jars. Powdered peanut butter can last up to 15 years on your shelf if you keep it in a cool, dry pantry. It takes a little longer to prepare, but the longer shelf life and reduced storage space can make it worth looking in to. If you are looking for something on the go, a bar high in calorie content in protein is always a good choice. Instructables has a pretty good write up on an easy high calorie survival bar with peanut butter as the main ingredient. They are pretty tasty (as opposed to hardtack) and a few squares can provide enough calories to get you through the day. Check it out if you are looking for a good mobile peanut butter recipe: Easy-Peezy High Calorie Survival Bars. If you are like me and avoid the kitchen most times, you can find mass produced energy bars with plenty of peanut butter in them. Keeping food with long shelf lives and good nutrients back stocked in your pantry is easy and makes sense. 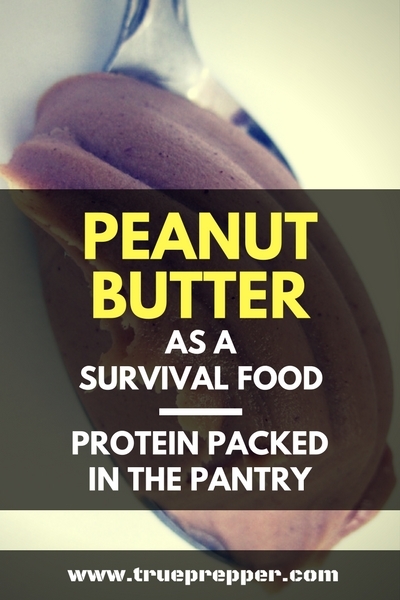 Food with high protein and calories by weight makes for a good survival food option on the go. Peanut butter fits both these roles, and is easy to eat without utensils. As long as you aren’t smacking your lips, it makes for a stealthy food option as well. The point is, keep a good variety of foods and nutrients in your food storage plans for both your pantry and your bug out bag. Keep exploring, stay prepared, and be safe. Is your nutrient data for the natural or the (Un-natural) one? Although I do like the natural when I open it, I don’t like the refrigeration part. That issue may be a problem in a SHTF scenario too. I buy Skippy when it goes on sale at Costco and have had no issues having it 4 years after purchase. Oh, it mixes better with chunky. I’ve been a full-press prepper since before Y2K. Smuckers peanut butter is the downright best! I’m eating Smuckers from 2007 as I’m typing this. Stored in my basement on shelves. Mix it with Bacon Bits and spread it THICK on a prepper cracker and you’ve got an entire meal! (seal the jar TIGHTLY after using. Wipe off the butterknife with a scrap of paper). Now you’ve got an entire meal! For variety, mix it with chopped green olives. Or with pieces of canned fish. Or, with chopped nuts. If dry, pour in a coupla tablespoons of olive oil (lasts forever!) and mix thoroughly.